We love dogs, but we love war dogs even more because apart from being loyal and cute, they can be absolutely badass. We are so obsessed with these awesome canines that we made a collection of the 30 best photos we could find all over the web. Enjoy. BADASS: War dogs are not new. They used them in armies thousands of years ago. These are US Army paratrooper rescue dogs being trained in 1944. CUTE: Some start like this, as cute puppies in the Military Working Dog Breeding Program on Lackland Air Force Base in San Antonio. BADASS: This is Rambo, an explosive detector dog assigned to the U.S. Air Force 447th Expeditionary Security Forces Squadron chomping on a soldier for training. BADASS: Dog and US Army Special Forces soldier jump to the sea off the back of a CH-47 Chinook helicopter. CUTE: "I'm so happy! "—these dogs are trained with positive reinforcement conditioning techniques. They truly love it. CUTE: Two buddies resting. Explosive hunter dog Troy and U.S. Marine Corps Cpl. Derrick Magee on a patrol break in Afghanistan. BADASS: First military dog-human tandem airborne jump from 12,500 feet. CUTE: You take your dog around the block. Senior Airman Stephen Hanks takes Geri around Sather Air Base's perimeter, where he pees on tanks' threads. CUTE: Staff Sgt. Erick Martinez carries Argo III over his shoulder. It's an exercise to build trust and loyalty between them. CUTE: Apparently, being carried makes dogs very happy. This is Reyana on Senior Airman Beaun Clegg's back. CUTE: Not all war dogs are German shepherds. Here's eight-year-old explosives sniffer Springer after a helo ride. BADASS: Dogs wear goggles too to protect their eyes. They actually call them doggles. Seriously, that's the actual name. The dog's name is Rico. BADASS: More doggles action, because there's never enough doggles action. Ajax doesn't seem to mind them. CUTE: This is Panzer and US Army veteran Brad Schwarz, who suffers from post traumatic stress disorder. Panzer is not a war dog, but a service dog who helps war veterans. BADASS: War dogs like to jump through car windows, just because they can. BADASS: Rangers and a multi-purpose war dog being awesome in the dark. CUTE: Mack and Senior Airman Gregory Darby. Just bonding. CUTE: War dogs love tennis balls. This is Coba, a 3-year-old chocolate lab and tactical explosives detector dog. BADASS: Meki hoisted up to a medical evacuation helicopter in Alaska. War dogs are treated just like their human buddies. BADASS: War dogs even give blood to save their fellow canines. Here's Carly M745, a security forces K-9 being sedated to have blood drawn on July 3. SAD: War dogs die too. Rony was a patrol dog for President Barack Obama and Vice President Joe Biden before dying on March 8, 2012. CUTE: Liaka, a Dutch shepherd, quietly receiving instructions from her handler on a mission in Hadar, Baghdad. CUTE: Search and rescue dog Ronnie high-fiving U.S. Air Force Capt. Greg Auerbach, an KC-135 Stratotanker aircraft instructor pilot with the 54th Air Refueling Squadron. 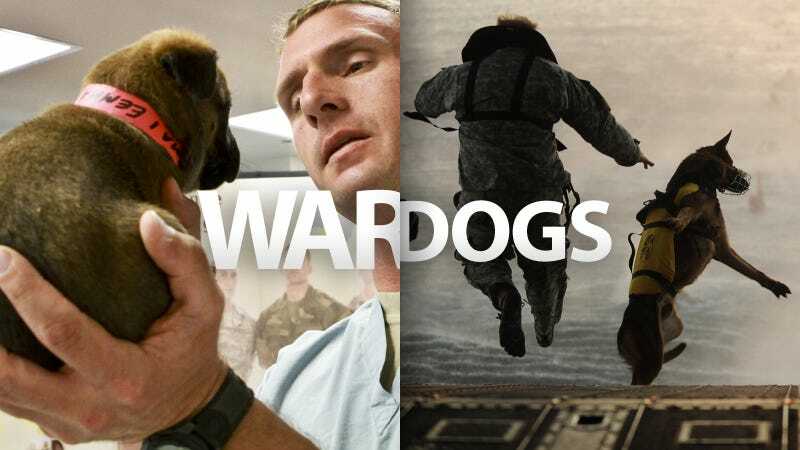 BADASS: When they are done with their mission, war dogs need to extracted too. Here are some Navy SEALs demonstrating a Special Patrol Insertion/Extraction with one of their dogs.